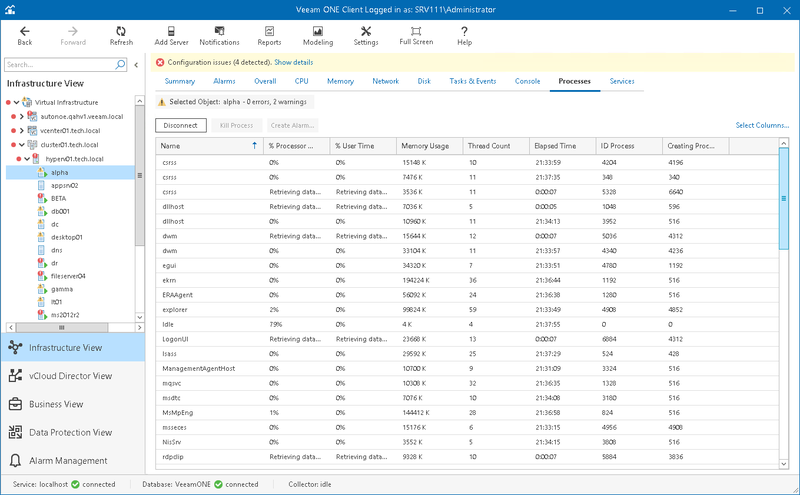 You can view and control processes that are currently running inside a virtual machine or host. 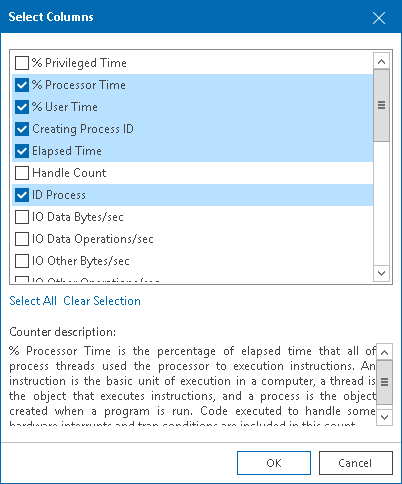 On Windows-based machines, you can view, end or restart processes. On Linux-based machines, you can view or end daemons. For Windows-based machines, make sure that the Remote Registry Service is started. For Unix-based machines, make sure that the SSH Server is started. At the bottom of the inventory pane, click Infrastructure View. In the inventory pane, select the necessary infrastructure object. Provide OS authentication credentials (user name and password) to access the list of running processes. In the upper right corner of the Processes dashboard, click the Select columns link. In the Select Columns window, select check boxes next to counters you want to display. To view a detailed description of a counter, click it in the Counters list, and the description will be displayed in the lower pane of the window. [For Windows-based machines] To end a process, select it in the list and click the Kill Process button, or right-click a necessary process and select Kill Process from the shortcut menu. You can also right-click a necessary process and select Kill Process and choose the necessary option from the shortcut menu. To create an alarm, select one or more processes in the list, click the Create Alarm button, and select the type of rule on which the alarm must be based. For details on alarm rules, see Alarm Rules.